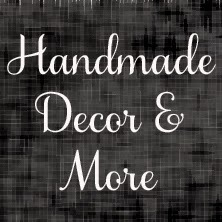 I can't believe I'm saying this…but I made a Facebook page and opened an Etsy shop! There's not much on there yet, but I'd be honored if you'd join me on my new Facebook page (please "like" this page) where I'll be highlighting some of my signs and projects from the Carriage House. I also opened an Etsy shop. This is an exciting (and scary) new adventure for me. I hope to get more listings added this weekend. :) Thank you for your support!